It’s official! I received my invitation kit this afternoon and as I expected, the winner is Burkina Faso! I’ll depart October 10th for Orientation (which I believe will be in Philadelphia) and then arrive in Burkina Faso on October 13th, where I’ll be in training through December 17th. My official two years of service will be from December 18, 2010 – December 18, 2012. Wow. I am beyond excited, though certainly intimidated by the amount of tasks I’ll need to get taken care of in the next 8 weeks. Anyone else out there heading to BF in October? Get in touch! Hey, congratulations! I’m not in Burkina Faso, but I am in Philadelphia. If your training is here, get in touch. I would love to show you around and discuss PC if you’re free. So jealous…knowing your location is fabulous, knowing your dates and having them laid out for the next few months is even better. I am lucky I have a job I love, but not knowing when I will leave is beginning to make me crazy. 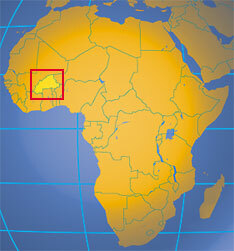 My name is Laura and I was on the internet doing some research about Burkina Faso and I came across your blog! I just received my invitation in the mail today. It sounds like we will be in the same program starting in October! Great to see someone in the group! Shoot me an email at sworthington at gmail.com if you want to chat packing strategies, paperwork, etc. Looking forward to meeting you! I also just received my invite today for Burkina Faso (small enterprise development) and stumbled across your blog; I am excited to hear of others heading there too! It’d definitely be great to be in contact as our departure gets closer for packing, etc. help. Feel free to email me at amgreteman@gmail.com and I can’t wait to meet you both at staging! Anne, my e-mail is laura.schragg@gmail.com. Feel free to e-mail me whenever. I know we have a lot to do and a lot to pack, so bouncing ideas off of each other might be good! Thanks! Can’t believe how soon you’re leaving yourself! Slowly but surely we’ll make sure the Worthingtons take over PC, haha. Not sure where you are right now, but let’s talk soon! Hi Keith! I just shot you an email – boy you opened a wormhole when you offered to answer questions, haha. Hopefully I kept the list short and sweet. « Invite is in the mail!